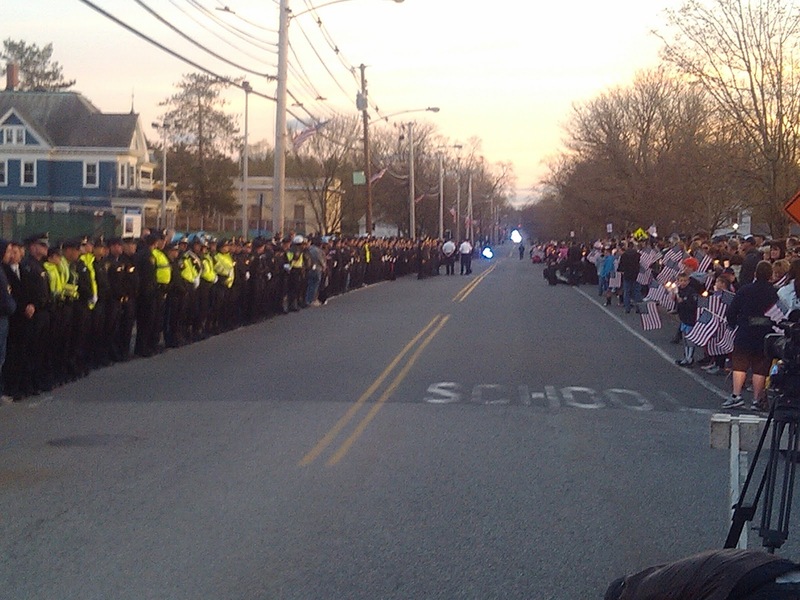 On Sunday April 28th, the citizens of Gloucester and surrounding Cape Ann joined together to support local organizations in a fundraising walk known as the “Pride Stride”. This year marked the 26th anniversary of the event, and I am honored to have been able to participate yet again. From a great spot on Stacy Boulevard, we provided hundreds of walkers who partook in the Pride Stride with water and other refreshments. I want to thank Anthony and Joanne Marks, and Lisa-Marie Cashman, for assisting me at the water stop this year. Thanks to everyone who contributed to a terrific Pride Stride 2013! Below are a few pictures taken by Anthony Marks of activities at our water stop. You can learn more about the Pride Stride by clicking here. Earlier today I was interviewed by Channel 5 Reporter Jorge Quiroga regarding a Boston Herald report that revealed that Boston Marathon bombing suspect Tamerlan Tsarnaev had previously been receiving welfare benefits. Please tune in to tonight’s evening broadcast at 5:00pm, 6:00pm and again at 11:00pm to view today’s interview. 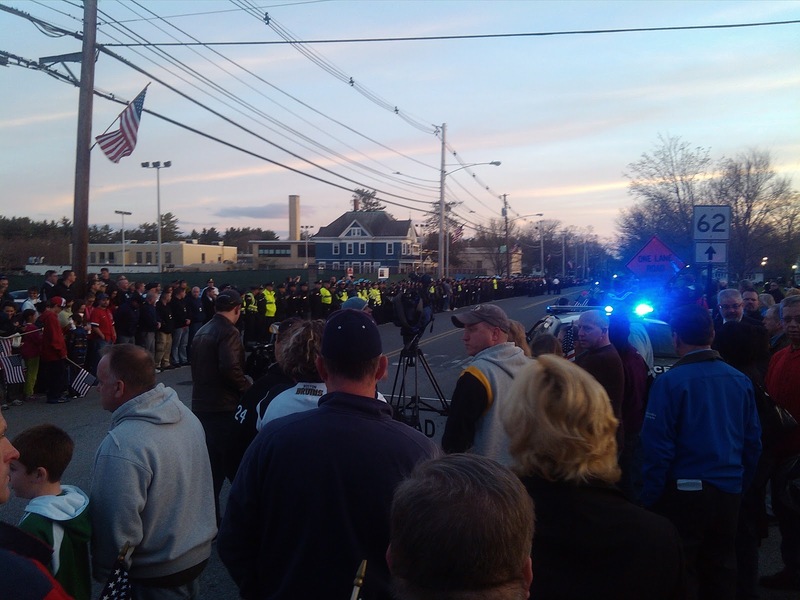 On Saturday night in Wilmington more than a thousand people gathered to attend a candlelight vigil to honor MIT Officer and Wilmington High School graduate Sean Collier. 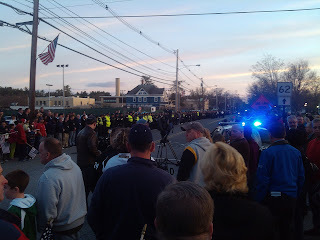 The emotional crowd lined Church Street holding candles and American Flags as his body was escorted to his home town by a procession that included official police vehicles from departments and agencies throughout the region, and an American Flag display by the fire departments of Wilmington and North Reading. He died in service to us all, and I am honored to have had the opportunity to address the crowd during Saturday’s vigil. Members of Officer Collier’s family were present and offered inspirational remarks about his life of service to the community. The well-attended ceremony was very moving, and was an important part of the healing process that must follow the tragic events of last week. The vigil provided us an important opportunity to express our support for all of those that must deal with the loss of this courageous young man. This past week has been difficult on us all. I’m thankful that people like Officer Collier have given us a legacy of strength in the face of terror, and I’m also thankful for all of those who carry on that legacy of working to keep us safe. Posted below are a few photos that were captured at the event. Protecting public safety is a top priority, and it is critical that the people that protect all of us have the resources they need to do the job. The situation we face demands that we work together and take all necessary actions on this front. That is why on Thursday, April 18th, the legislature passed a bill filed by Governor Patrick that would create a reserve fund of $5 million dedicated to the state’s costs associated with the Boston Marathon bombing. The bill also dedicates $1.5 million to the Massachusetts National Guard’s current budget for immediate needs. The response by public safety personnel to the harm and continuing threat caused by these terrorists has been and continues to be tremendous, and we all owe them an incalculable debt of gratitude. Posted below is the text of the bill. Yesterday’s bombings at the Boston Marathon are horrific and tragic, and defy comprehension. These bombings were murderous and evil acts, and they must be confronted with the strength that comes from unity, compassion for the many who have suffered, and a resolve to help our neighbors and bring those responsible for these cowardly actions to swift and certain justice. We can all be inspired in these difficult days by the example set by the strength and professionalism of those who provided assistance to others yesterday. Amid chaos, pain and destruction, police, fire, EMS and medical professionals, volunteers, race officials, and spectators all responded to the needs of others, and brought light where evil had caused darkness. The marathon itself has traditionally served to remind us all of the greatness of a nation founded upon freedom, liberty and justice for all. We must all work to ensure that that purpose continues, and that even as one or more perpetrators have caused tragic loss of life, incalculable suffering and an attempt to tear apart the fabric of our society we will unify and support those who are suffering bring those who caused that suffering to a just punishment. The marathon stood for freedom when it started and must stand for freedom now. Now is the time to draw on our collective strength as a nation, a state, and a community, and to speak with a single voice, a message of compassion for victims and intolerance for the one or more cowards who are responsible for their suffering. While we feel emotions of sadness, frustration and anger, our American spirit must remain strong and uncompromised. The evil committed yesterday has caused a tremendous amount of pain and destruction in the lives of innocent men, women, and children, and it’s difficult to fully grasp the thoughts and feelings of those who were either harmed or have lost loved ones. My thoughts and prayers are with them. It is important that whoever needs assistance in coping with yesterday’s horrific events seeks help. One such resource is the Federal Disaster Distress Helpline, 1-800-985-5990, which provides a free counseling service to anyone affected by this tragedy. If you have yet to be able to reach a loved one please contact either Mayor Menino’s hotline at 617-635-4500, or call the Red Cross’s Safe and Well hotline at 1-800-REDCROSS. At this point in the investigation, public safety agencies and personnel are asking anyone who has any photos or specific knowledge that may be of assistance to please call the Boston Crime Tips Hotline at 1-800-494-TIPS or the FBI Tip Line at 1-800-Call-FBI. The investigation will be extensive, and any help that the general public can provide will be tremendous. If you need further information, have questions, comments, or concerns, please do not hesitate in contacting my office at 617-722-1600. During today’s Senate debate of a transportation finance bill, I offered an amendment that removes all taxes from S.1766, An Act Relative to Transportation Finance. The gas tax, and the computer services and software tax are just a few of the taxes and tax increases included in the bill. I offered the amendment together with the Senate Republican Caucus because we believe that there are other ways for the state to generate revenue without massive tax increases. There are significant reforms and cost saving measures that should be implemented before a dime is taken out of the pockets of the taxpayers. Revenue sources such as raising taxes and other similar measures could well destabilize what is already fragile economic recovery. Unfortunately, our view was not shared by the majority party and the amendment failed by a roll call vote of 4-29. Posted below is the vote made by all the members of the Senate. On Saturday, the Senate Republican Caucus was successful in securing several significant transportation reforms and a series of major reforms and initiatives geared toward accountability, performance and reducing dependence on increasing taxes. • Directing the MBTA to create a pilot program reserving a limited number of premium parking spots for customers willing to pay an elevated price to have a spot reserved for them. The House previously passed its version of a transportation finance bill, and now the two chambers will work together to reach an accord. Scaling Beacon Hill and Tarr Talk will continue to post roll call votes on the transportation finance bill taken during today’s Senate session. Votes on additional amendments and the final vote on the bill will appear next week. Amendment #58, which was sponsored by the Senate Minority Caucus, prevents the MBTA from continuing to develop expansion projects until the agency conducts a cost analysis of the proposed expansion. The amendment also requires that the agency must certify that the project won’t prevent the MBTA from generating sufficient revenue to contribute to its annual operating budget. Essentially, this amendment requires that a future expansion project would have to recover 34% of cost in order to be worth constructing. The MBTA shouldn’t expand for expansion’s sake, but should be targeting populations of people who will most utilize the service to reinvigorate both the local and statewide economies. Unfortunately, the majority party did not join Senate Republicans in insisting that future expansion projects aren’t a fiscal drain to the mass transportation system, resulting in a vote of 4-29. Posted below is the result of the vote. Senator Keenan offered an amendment to S.1766, An Act Relative to Transportation Finance, which would require the MBTA to include in its 5 year Capital Investment Program repairs to existing infrastructure sufficient to maintain a State of Good Repair rating level. Having a public transportation system in a State of Good Repair, or when the physical condition of transportation assets such as trains, buses, facilities, etc. are rated in a good condition by federal government standards, is imperative for the daily lives of those who depend on mass transit. The Senate Republican Caucus believes that a State of Good Repair is so important that the caucus included such a measure in Amendment #41, an alternative plan to massive increases in taxes to finance our transportation system. Fortunately, the membership voted with the minority party in supporting such a measure, and the amendment passed unanimously by a roll call vote of 33-0. Posted below is the result of the vote. During today’s Senate Transportation Finance debate, Senator Montigny offered Amendment #30, which would require the MBTA to seek private sponsorship and naming rights of stations. The Senate Republican Caucus agrees that the MBTA needs to join in such partnerships to capture the much needed revenue. So much so, the Republican Caucus has been calling for such actions for quite some time. The Senate Republican Caucus even included the measure in Amendment #41, which provides an alternative solution to raising taxes. Unfortunately, Senator Montigny’s amendment directs the revenue gained through sponsorship to be dedication to transportation expansion projects. The caucus believes that before the MBTA expands services, it should first address existing infrastructure. The amendment garnered enough votes to pass by a margin of 20-12. Posted below is the roll call vote taken on Amendment #30. Senate Assistant Minority Leader Robert Hedlund offered Amendment #23 to Senate Bill 1766, An Act Relative to Transportation Finance. Similarly to the Governor’s plan, S.1766 ties the gas tax to the inflation rate causing the tax to periodically increase over time without constraints or safeguards. Sen. Hedlund’s amendment would prevent an automatic gas tax increase and would require that all gas tax increases in the future be legislatively approved. Unfortunately the amendment failed to secure enough votes for passage by a margin of 5-27. Posted below is the result of the roll call vote taken on the measure. Senator Rush offered an amendment to the bill regarding the deferral of the gas tax increase it contains. If passed this amendment would create a special legislative task force to investigate, study, and develop a legislative package to include MBTA cost saving reform measures and potential new revenue sources. Pursuant to the amendment, the gas tax increases in the current bill would not go into effect until the task force develops a reform package that is signed into law. This amendment is meant to force state government to address cost-saving reforms before asking for more money from taxpayers. Unfortunately the amendment failed by a vote of 7-24. Posted below is a copy of the actual roll call vote taken by the members. During the Senate rules debate on January 24th, the Senate Republican Caucus was successful in passing a Senate rule that requires the posting of roll call votes on the state legislature’s webpage within 48 hours of the vote being taken. That vote was passed unanimously by a vote of 39-0; however, it will not take effect until May 1st. Until then, we will post them starting with S.1766 (http://www.malegislature.gov/Bills/188/Senate/S1766/Amendments) on www.TarrTalk.com and www.ScalingBeaconHill.com. This is a transparent measure to allow everybody to be able to see how their State Senator voted on a particular measure. Posted below is the first of the roll call votes being taken on S.1766. I offered this roll call vote to postpone the bill to a later date. Last evening at 5:00pm there was an amendment filing deadline to S.1766, and during that time period there were over 100 amendments filed. My motion for postponement until April 22nd was to afford the members of the Senate more time to read and understand the amendments before they are expected to vote on them. Unfortunately, that motion was defeated by a vote of 3-30. Keep checking back today to view all of the posted roll call votes. Tax of the day: Governor wants to end commuter deductions on tax returns for those who use the MBTA or pay tolls to get to work. * The Tax of the Day series is presented by the Senate Republican Caucus spotlighting tax proposals made by the Governor in his FY’14 budget proposal. “It is outrageous that on the eve of Senators being asked to consider millions of dollars in tax increases and new spending for transportation needs, we discover exorbitant expenditures on personnel costs at the MBTA and a complete lack of transparency that has shrouded these costs from public view even as transportation officials plead their case for more and more money. Tax of the Day: The Governor wants to end $1,000 exemptions for dependents of taxpayers 19 years old or older who are full-time students. Tax of the day: Governor seeks to require college scholarships to be reported as personal income causing those who pursue higher education to pay even more! The Governor wants to end tax deductions for adoption fees, and start taxing employer provided adoption assistance as personal income, which would further complicate the adoption process. To read more regarding the Senate Republican’s “Tax of the Day” series, please click here. Governor Patrick seeks to eliminate the hotel tax exemption for small Bed and Breakfasts. The tax will hurt local small businesses and hamper the economy. With an onslaught of taxes being proposed on Beacon Hill, the Senate Republican Caucus will identify and focus on one each day in a series of posts called “Tax of the Day” on the Caucus’ blog (www.ScalingBeaconHill.com), twitter (@SenBruceTarr), and their Facebook Fan Page. The primary source cited will be Governor Patrick’s tax and spend state budget proposal for FY’14. A tidal wave of new taxes is headed towards us, and people need to know before they drown in higher taxes, tolls, fees, and fares. Posting each tax increase proposal will increase transparency and help us all to focus on just how much of a new burden we will have to bear if the measures become law. In the Governor’s budget proposal he targets over 40 personal tax exemptions, deductions, and credits; corporate and business taxes; changes in tax rates; increases to certain already taxed items; increases in fares, tolls, and fees; and others. Earlier today, I testified before the Joint Committee on the Judiciary in support of House Bill 3229, legislation I am co-sponsoring that would expand the juvenile court’s jurisdiction to include 17-year-olds found to have committed mostly misdemeanors and other non-violent crimes. Currently, all 17-year-old offenders are processed through the adult court system. Research has shown that kids placed in the adult system are more likely to re-offend and to commit more violent crimes than their peers who are placed in the juvenile system. Also, children held in adult facilities are at an increased risk of suicide and of becoming victims of physical and sexual assaults. By placing 17-year-olds in the juvenile court system, they will be able to continue their education and participate in age-appropriate treatment and counseling. More importantly, making this change will also ensure that parents are notified when their 17-year-old child is arrested, and will enable them to be involved in the court process, something that is not allowed under current state law because 17-year-olds are treated as adults. Passage of House Bill 3229 would not bar 17-year-olds accused of murder from being tried and sentenced in adult court, nor would it prevent those individuals accused of other serious crimes from being indicted as youthful offenders and given adult sentences. However, for 17-year-olds who commit lesser crimes, this change makes perfect sense. Recently, there was an editorial in the Gloucester Daily Times further highlighting the importance of changing the juvenile court’s jurisdiction to include 17-year-olds. Please click here to read the editorial. One hundred and ninety two years ago, the people of Greece rose up to proclaim their independence. Brave men and women stood for their values of freedom and democracy, and endured the sacrifice, pain and hardship necessary to defeat oppression and give rise to an independent Greek nation. Friday, April 5th their spirit, and all that has been achieved through that spirit, will be celebrated at the State House. This year’s event will begin with a special reception in the House Member's Lounge beginning at 12:00pm. Following the reception, a commemoration ceremony will take place in the House Chamber at approximately 1:00pm. Metropolitan Methodios, Consul General Ilias Fotopoulos and many elected officials and dignitaries will also be participating in this year’s ceremony. Friday’s events are open to the public and your presence would be most welcomed. I sincerely hope that you will be able to join us. “The framework announced today by the Senate President and the Speaker makes it clear that there is no legislative appetite for the massive increases in taxing and spending proposed by the Governor, and brings focus to the task at hand of addressing troubling deficiencies in our state’s transportation infrastructure. Yet today’s proposal focuses too narrowly on increased taxes, and relies too little on the strong reforms needed to ensure that taxpayer and ratepayer funds are invested in a system that is functional, reliable and not plagued by waste or abuse. Too many requirements mandated by the 2009 Transportation Reform Act have at worst been blatantly ignored, or at best been too slow to produce results. Billions of dollars in projected savings have gone unrealized, efforts to increase the efficiency and integrity of the system have gone unheeded, and opportunities to partner with the private sector have fallen by the wayside. Our first priority should be on capturing the savings we’ve already demanded legislatively and promised to the taxpayers and ratepayers. In the days ahead, Senate Republicans will work to populate the framework with needed and productive reforms that will emphasize savings and efficiencies to close the present and future funding gaps facing our transportation system. New revenues for transportation cannot come from increasing the burden on working families, who are already feeling the pressure of living with the fourth highest per capita tax burden in the nation. Increasing that burden should not be our first choice.